Posted on December 31, 2010 at 10:51 am in Hindi movies	| RSS feed You can skip to the end and leave a reply. Looks like heaven. You know how to celebrate, baby! Ditto that! I hope Feroz is on his way to MY house. Feroz, Shashi, Dharam, the Khanna men…all on their way! Happy new year Memsaab! hope ur dad’s doing well and u allhave a gr8 year ahead! 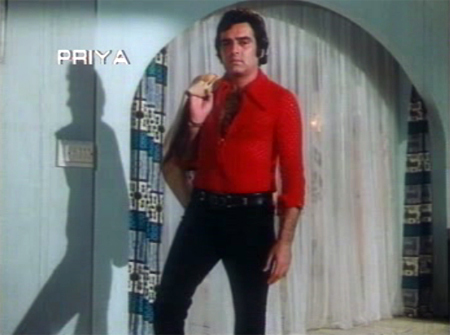 Now I think every house should have that Feroz Khan look alike standing just like that..hmmm Happy New Year to all! He was such a very MANLY MAN. 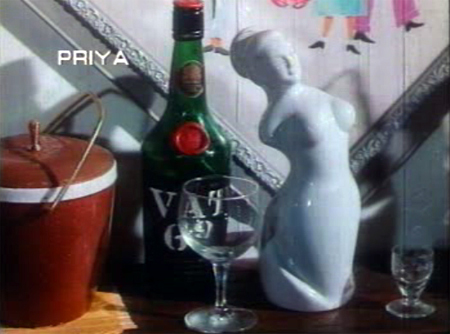 Actually, wouldn’t it be fun to create a line of life-sized figures of old B’wood actors and actresses???? What a fantastic idea! Happy new year memsaab. I’ve been crazy busy and am only just coming up for air. Look at what all I have missed. And the very same to you, Memsaab. And hope you come to India this year. I won’t be there next month as I’d hoped, but am working on April now with my pal Suhan (whom you must also meet :) Hugs, and happy New Year to you and Teja and Dhanno! Oh it will be very very hot in April in India. Sounds like you had fun :) Here at the old folks’ home they had a demure cocktail hour from 5-6 pm in the lobby, but that was about it, ha ha. Happy new year. It is a nice first post (with lovely screencaps) for the year 2011. Happy New Year to all of you. Hope you have a rocking decade ahead !! Thank you Shashi :) I wish the very same for you! Memsaab: Naya Saal Mubarak, and to all the fellow Filmi Lovers as well…. Memsaab, I have a request, can you please do a post on all the clubs from the early 70’s, you know The Slip Disc, The Blow Up at the Taj Mahal…God, I want to see the action from that era…if you have any photos from your magazines, even though unidentified clubs, please post them; I want to see the stars in action in clubs…I remember so many photos with a wine glass in hand, a Rishi, or a Rajesh chatting up storm with a beautiful girl…I miss those shots.. I wish you all good health and happiness!!! I don’t have any knowledge of clubs in Bombay in the early 70s, and most photos of stars out “on the town” etc. don’t identify where they are either (except by event name if applicable)…I think you should find someone else who might have known the club scene in the 70s to get that kind of info. Most of my magazines as well are from the late 70s into the 80s, not the early 70s. Thank you for your reply, I too have magazines but they are also from the same time period and later, when we moved to Canada, we were basically cut off from India for few years back in the mid seventies. Happy New Year! Wishing you health and happiness, sparkly clothes, bubbly drinks and lots of catchy songs in 2011!! …will do; I think this should be interesting for all – there are many club scenes and they are all so interesting – let’s see we we can figure out – Oh, there is one Priya Rajvansh (Hanste Zakh) meets Navin Nischol – they at at a disco club – real groovy!!! 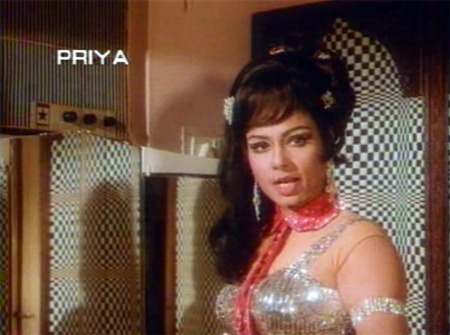 totally psychedelic Tune from Composer Madan Mohan; and the Fashion – unbelievable, Navin looking HOT in scarf!! Dear memsaab! Happy new year to you. Wishing you all the best for 2011. Thanks Neena, same to you :) Hope to get to another review SOON! Happy New Year to you Greta! I hope that this year is much better for you and your family. I am so pleased that you are part of the set here too :) Happy New Year, Suzanne. Very happy New Year to you Memsaab – 2010 was brighter for having met you! Hi Greta, A plentiful year to you, full of friendliness and pleasure and craziness and rishiness and ferozness and bollywoodness!!! @Memsaab – Wishing you a very happy new year! No, I have not had much time. My father was ill for three weeks before Christmas, and he passed away this week on the 4th. I am not much in the mood for writing although it’s a nice distraction to see comments here from people and I appreciate all the holiday wishes, and people’s thoughts :) I will start writing again soon, when my heart is less heavy. @Memsaab – Really sorry to hear that. Please accept my condolences. This must be a particularly difficult time. I am sure all of us who frequent this blog site share your loss. My deepest condolences for the loss of your father, Greta. Thanks John. He is sorely missed. I am as blessed as a girl could ever be to have had him as a father. And to have the support now of my friends here :) Thanks.